Extended Operating temperature of -40 to 85°C and optional conformal coating to protect against condensing humidity. Data-transmission mechanism fully transparent to such IP video compression schemes as MPEG-4, H.264 and MJPEG. Flexible Installation—Wall-mount ready and an optional DIN rail mounting kit is available. Multiple Line Rates Supported—Switch-selectable rate mode options optimize rate and reach for the noise environment, wire gauge/type and length. A built-in 4-port Ethernet switch ideal for delivering multiple IP information streams over a single cable. Aggregate IP data from a laptop, a motion sensor, and two high resolution IP video cameras for simultaneous transmission over a single Ethernet connection. Ethernet Extension— Extend 10/100Base-TX Ethernet well beyond its 328-foot (100-meter) limitation over a single unshielded twisted pair (UTP) or Cat 5e/6/7 cable. Ruggedized—Operating temperature of -40 to 85°C and optional conformal coating to protect against condensing humidity. Plug and Play—Set these units up straight out of the box. No configuration is required. Auto-sensing 10/100 Ethernet ports support full or half duplex operation. Transparent LAN Bridging—Bypass network configuration requirements by transparently passing all higher layer protocols—including 802.1Q VLAN frames (tagged and untagged). Data-transmission mechanism is fully transparent to such IP video compression schemes as MPEG-4, H.264 and MJPEG. Made in the USA — This Patton equipment is designed by Patton engineers and built in our Gaithersburg, Maryland facility. 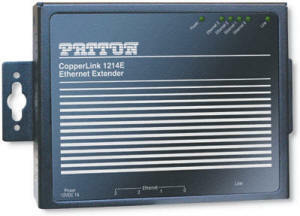 Patton’s American-made manufacturing process delivers high-quality networking solutions with reliability you can trust. Perfect for bandwidth-intensive applications the CopperLink™ 1214E delivers off-the-chart symmetrical line rates greater than 168 Mbps. Best of all—like all CopperLink™ products—the CL1214E leverages existing copper infrastructure to deliver high speed Ethernet connectivity over single twisted-pair or Cat 5e/6/7 cable. Symmetrical line-rate settings are ideal for such applications as remote LAN extension, video teleconferencing, and data backhaul. Asymmetrical configurations are well-suited for applications requiring higher downstream speeds and/or longer distances between Ethernet devices. Typical asymmetrical scenarios include medical imaging, livestock monitoring, underwater video, internet gaming, and transporting high-resolution IP video from security cameras. Copyright © 2019 Patton CopperLink.